Poor Flash! He's just a pup, and he's keeping his new owner busy. When the cat spots the new puppy, she does what any cat would do. She RUNS! Then so does Flash, with a WOOF! The cat runs up a tree, and smirks down at the pooch while his little owner fusses. She keeps Flash outside to work off some of his exuberant energy, but then he spots the clothes hanging out to dry on the line. They snap, and flap, and flip and tease in the wind, but when Flash grabs a shirt sleeve and gets a good grip on it, there's another sound. R-i-i-i-p-p-p! Flash is corraled and kenneled to think about it, but once he's out of the doghouse, there're more puppy problems. He jumps with muddy paws into the basket with the clean clothes. He chases the girl and catches the hem of her skirt in his little puppy teeth. What can his well-meaning little owner do? 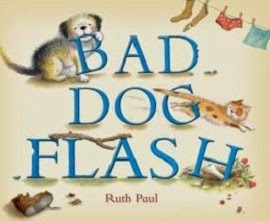 Ruth Paul's clever and rhythmic rhymes make this story practically read itself, With a plot that new puppy owners will recognize and expressive characters--girl, pup, and even the supercilious old cat--that inspire empathy, this new dog tale is great for readalouds with its repeatable refrain, as well as for beginners to try out their reading skills. There is also a lot to discover in Paul's good-natured humorous illustrations of one naughty but undeniably cute little puppy. steam game keys Buy Cheap Game CD Keys & Steam Game Keys at Reasonable Rates. Topgamescdkeys.com is a trusted online CD key store for games, videos and more.